West Michigan Global Initiative brought a Medical Delegation by Syktron to learn about their role in Healthcare and West Michigan. Paul Heule, the honorary consul for The Netherlands in West Michigan, says he hopes a 25-person delegation from Dutch agricultural and medical device companies, gained an appreciation for West Michigan during its three-day visit this week. 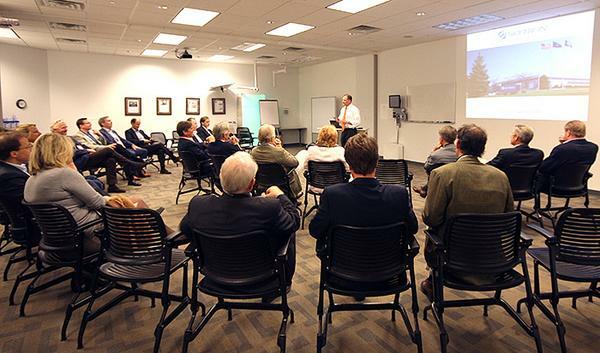 The bridge between West Michigan and its Dutch roots is continuing to grow as a delegation of business leaders from the Netherlands again visited the region to explore West Michigan food processing and agricultural needs. The West Michigan Global Initiative (WMGI) hosted a private, wind-down “Afterglow” reception May 7, 2014, with Dutch Ambassador to the U.S. Rudolf Bekink and General Consul Klaas van der Tempel. The reception was held at New Holland Brewing in downtown Holland, and featured many leaders from throughout West Michigan. (Left to Right) Mayor Kurt Dykstra, City of Holland, MI. Klaas van der Tempel, Consul General of the Netherlands, Chicago. Jeb Burns, WMGI Co-Founder and President. Rudolf Bekink, Ambassador of the Kingdom of the Netherlands. (Left to Right) Rudolf Bekink, Ambassador of the Kingdom of the Netherlands, and Jeb Burns, WMGI Co-Founder and President. help the survivors and victims' families.